Rep. Randy Hultgren (R-Ill.) meets with staff from Illinois credit unions and the Illinois Credit Union League during a "Hike the Hill" visit to Capitol Hill this week. 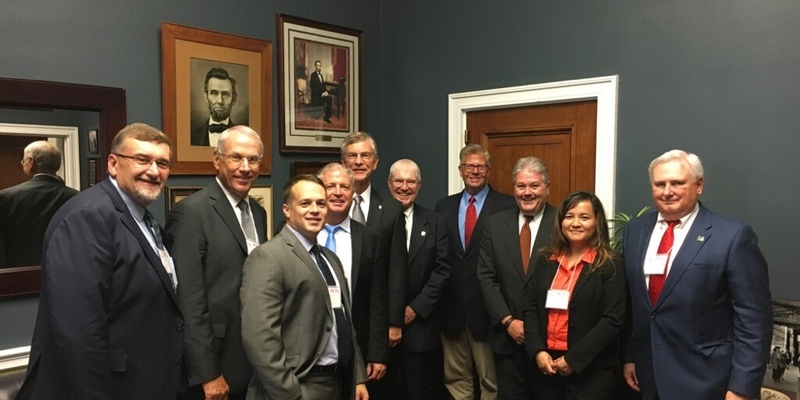 It was a busy week in Washington, D.C. for credit unions, as five credit union leagues representing nine states came in for Fall “Hike the Hill” visits to discuss credit union issues with legislators and regulators. The Credit Union Association of the Dakotas, Illinois Credit Union League, League of Southeastern Credit Unions, Georgia Credit Union Affiliates, and Mountain West Credit Union Association participated. Many young professionals kicked off their week with CUNA’s young professionals advocacy training. The visits throughout the week included dozens of meetings with elected officials on Capitol Hill, and officials at NCUA and the Bureau of Consumer Financial Protection, as well as briefings from CUNA staff.